Few joys in life are sweeter and longer lasting than knowing that you have helped others take the restored gospel of Jesus Christ into their hearts. Having that joy is the opportunity of every member of the Church. When we were baptized, we made a promise that we would “stand as witnesses of God at all times and in all things, and in all places that [we] may be in, even until death, that [we] may be redeemed of God, and be numbered with those of the first resurrection, that [we] may have eternal life” (Mosiah 18:9). All members accept part of the charge given to the Church to take the gospel of Jesus Christ to the world, wherever and as long as they live. The Lord said it clearly: “Behold, I sent you out to testify and warn the people, and it becometh every man who hath been warned to warn his neighbor” (D&C 88:81). Full-time missionaries are to have the power to teach those who are not yet members of the Church. Members of the Church are to have the power to find those the Lord has prepared for the missionaries to teach. We need to exercise our faith that the Lord has prepared people around us to be taught. He knows who they are and when they are ready, and He can guide us to them by the power of the Holy Ghost and give us words to invite them to be taught. The promise the Lord gave to a missionary in 1832 is also the promise He gives to us in our charge to find people ready for teaching by the missionaries: “I will send upon him the Comforter, which shall teach him the truth and the way whither he shall go; and inasmuch as he is faithful, I will crown him again with sheaves” (D&C 79:2–3). “And now, if your joy will be great with one soul that you have brought unto me into the kingdom of my Father, how great will be your joy if you should bring many souls unto me! “Behold, you have my gospel before you, and my rock, and my salvation. “Ask the Father in my name, in faith believing that you shall receive, and you shall have the Holy Ghost, which manifesteth all things which are expedient unto the children of men” (D&C 18:16–18). In addition to the Holy Ghost to help us recognize and invite those ready to be taught, the Lord has called and trained leaders to guide us. In a letter dated February 28, 2002, the First Presidency placed increased responsibility for missionary work on bishops and wards.1 With the help of the ward or branch council, the priesthood executive committee develops a missionary plan for the unit. In that plan are suggestions on how members can find those ready to be taught by the missionaries. There is a person called as the ward or branch mission leader. That mission leader has close contact with the full-time missionaries and their investigators. Pray to be guided by the Holy Ghost. Talk with local leaders and missionaries, asking for their suggestions and promising them your help. Encourage those involved with you in this work. And be a witness at all times in what you say and do that Jesus is the Christ and that God answers prayers. I testify that the Holy Ghost will direct you to those who seek truth as you pray and work for that guidance. And I know from experience that your joy will be lasting with those who choose to take the gospel into their hearts and then endure in faith. See “News of the Church: Ward and Branch Missionary Work Emphasized,” Liahona, Aug. 2002, 4; “Stake Missions Recently Dissolved,” Ensign, June 2002, 76. Teaching, No Greater Call instructs us to encourage those we teach to set goals to help them live the principles they have learned (see page 159). 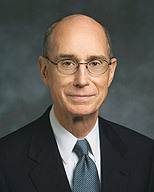 With the family, consider identifying the blessings of missionary work as mentioned by President Eyring and, if prompted, invite the family to set goals for sharing the gospel. Consider brainstorming with the family ways to share the gospel, remembering President Eyring’s counsel that “the simplest way will be the best.” To learn more about brainstorming, see Teaching, No Greater Call, page 160.